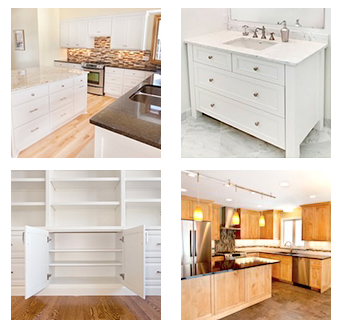 Last week, we discussed the role that custom cabinets play when it comes time to physically opening up a kitchen space by removing walls and overhead cabinets. 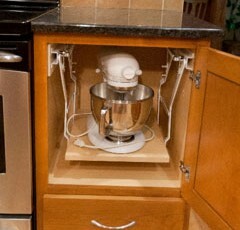 This week, we’re taking a different approach to the question of how to open up your kitchen. Specifically, we have some tips and tricks for you on how to make a small kitchen appear larger without removing any walls. 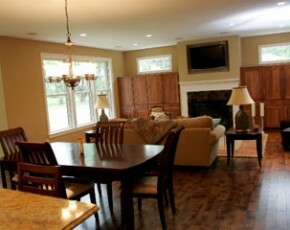 Break tradition by removing your full blocks of cabinets. 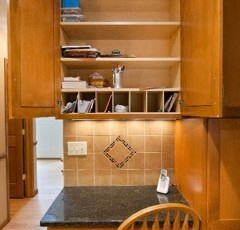 Replace them with an open shelving scheme that allows your eyes to travel to the wall instead of the front of a cabinet. There is one sticking point with open shelves that does not always make them the best choice for homeowners. You have to cut back on the clutter—open shelves have to look open. So you need to choose very carefully what you can store there. If you do not want to lose your cabinets altogether, consider switching out the full doors for glass-front doors. These also draw the eye back to the wall, adding depth to your room. 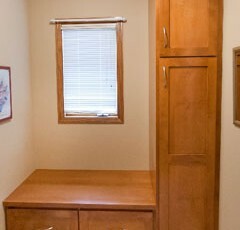 As you do not have to use glass-front cabinet doors on every cabinet, you get to store a larger number of items. White is the primary color kitchen designers use to open up a small kitchen. White reflects light, which makes the walls and ceiling look farther away than they actually are. If you aren’t the biggest fan of white, choose lighter colors that make your space feel brighter and bigger. 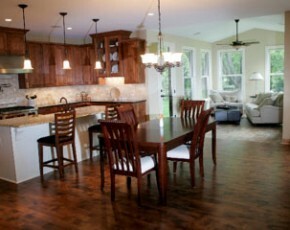 We all love the added storage and workspace that an island can offer any size kitchen. Instead of building a stationary island, however, consider instead adding in a small movable island for workspace that can tuck away nicely when not in use. What’s Your Favorite Way to Open Up a Kitchen? Many of the things you can do to open up your kitchen really have to do with tricking the eye into believing the space is larger than it actually is. Several of the options listed above do this. But these aren’t the only ways to do it. We’d love to hear your favorite method of making spaces look larger than they are. Share them with us here in the comments section, call us at 952-737-7088 or send us an email or give us a call!